Know what to inspect, what equipment to have and which procedures to practice. There are varying opinions on the amount and type of safety equipment and procedures on the water, but one thing’s for sure: you can always be safer. All of the points outlined here need to be customized to a vessel’s size and type, its cruising grounds and the owners’ experience, but they’re a good starting point for thinking about some of the right things. The best prevention is preparation. Keeping your boat’s equipment in good working order may stave off catastrophe as well as discomfort. Annual and/ or pre-departure inspections of certain areas and systems will save money and headaches. Spend some time on the bow and inspect what could be your cheapest insurance: the ground tackle and windlass. Look at the top and bottom of the bow roller(s). Do they turn? Are there any cracks in the surrounding structure? Check the anchor shackle to see if it’s still wired shut, and inspect the swivel to make sure it turns freely. Test the windlass. Take off the cover, check the pawls, lubricate necessary points and visually inspect the wire connections. Inspect the chain and its connection to the boat. If the exposed end looks sketchy, consider cutting off a few feet. If you carry a stern anchor, dig it out of the lazarette and check it too. There are few quick fixes for a steering failure on a powerboat, so prevention is key. Inspect the condition of steering cables and their connections. Top up steering/ hydraulic fluids. Take a look at the rudders and their posts (if the boat’s hauled out), and if the boat has pod drives, get a professional review before a long trip. Sailboats have manual emergency tillers, but few mechanical jury-rigs can handle the torque on large powerboats, so test the autopilot, because in emergencies, you may be able to steer with it. A boat is built of pumps — fresh water, salt water, engine, A/C and others — but none are more critical than bilge pumps. Check to make sure the bilge pumps are clean, in good operation and have working alarm circuits. Trace the wiring, test the float switches and carry a couple of spare pumps and switches. European boats typically include manual bilge pumps, but that’s a rarity on powerboats built elsewhere, so carry a portable manual pump or have plenty of buckets. The engine room will take the longest to inspect, because there are so many systems to review. Start with hoses, which should be double-clamped. Wipe them and smell the rag to check for leaks (good fire prevention). Test the tension on the belts, the condition of the diesel fuel (add treatment if necessary), and look for loose or corroded wire connections. Test alarms and shut-down systems on the genset and the engines. Check the condition of the raw-water strainer, baskets and gaskets. Make a list of all necessary fluids, including steering, transmission, stabilizer, engine oil and coolant, refrigerant, and whatever else. Flush the cooling system and inspect or preventatively replace impellers. Set aside time for the batteries and switches. Inspect the terminals and posts for corrosion and clean them. Make sure the batteries are secured and can’t move. Top them up with distilled water if they are wet cells. Check the shore-power cord and inlet, inspect all wiring for chafe and count your supply of spare fuses. In reviewing your fire plan, learn how many and what kind of fire extinguishers are required by the Coast Guard for your class of vessel, and then double that number. Check the extinguisher expiration dates and pressures annually. Instruct all crew in their use — pull the pin and aim at the base of the flames. Keep automatic engine-room suppression systems in good order. A fire blanket near the galley may help, as will baking soda for small fires. Put fresh batteries in the smoke detectors. Finally, you already have large holes in the boat that need inspecting. Failed through-hull fittings can spell disaster, so check and/or replace them during the next haulout; it’s good preventive maintenance. Check for cracks, leaks and corrosion. Work the handles on the valves to make sure they don’t stick and that they close in a hurry. Keep an appropriately sized wooden plug tethered to each handle and a mallet nearby to drive the plug into the hole in case a seacock fails. Forespar sells small foam cones that may be used instead of wood and can plug an irregularly shaped hole. Make a drawing or a list of where all the through-hulls are located, including ones used for the engines, heads, refrigeration, A/C units and more. A comprehensive list of onboard safety items can get long, and much of it will be dictated by Coast Guard rules. But besides the mandatory fire extinguishers and life jackets, and the obvious fixed VHF radio and GPS chartplotter, here are other must-have items you’ll want aboard. Adventure Medical Kits (sometimes private labeled by West Marine) provide comprehensive and easy-to-use medical supplies that come with a well-organized manual for mountaineering and marine emergencies. Read the contents list before springing for a larger, more expensive kit. For longer voyages, your doctor may put together a customized kit, including personal medicines that should be packed with their original prescriptions, especially if you’re crossing borders. If you or one of the crew has a tricky ticker, consider adding an automated external defibrillator (AED). Most models now are under $1,000 and require little training to use. Emergency Position Indicating Radio Beacons (EPIRBs) and Personal Locator Beacons (PLBs) help locate a vessel or a crewmember in distress. These devices interface with the worldwide service of COSPASSSARSAT, the international satellite system for search and rescue (SAR). Registration is free and there is no subscription or annual fee for either. EPIRBs operate on 406 MHz, are waterproof and they float, and some even have a built-in GPS, making them GEPIRBs. They are registered to the vessel. PLBs, on the other hand, are registered to a person. They function much like an EPIRB but are about the size of a smartphone and are usually attached to life jackets for when people fall overboard or abandon ship. In case of an onboard electrical failure or an abandon-ship scenario, handheld communication and navigation equipment will be needed. Portable VHF radios and GPS units are affordable and easily stowed, so have at least a couple of each as backups. Some units are waterproof and float. Also, carry a variety of batteries of various sizes for these items — VHFs may have proprietary types — as well as for flashlights and headlamps. The Coast Guard specs the minimum number of life jackets or personal floatation devices (PFDs) for a particular vessel. However, they are often uncomfortable. Inflatable PFDs can be worn for longer periods and with less hassle, because they stay compact until they get wet, in which case they deploy. Check the expiration date on the CO2 cylinder and have a rearming kit handy. Consider adding a whistle, a light or a strobe, highly reflective SOLAS tape, a harness tether and a registered PLB to each PFD before a long journey. The Coast Guard has rules about the kinds and number of flares a vessel of a certain type must carry, so these are a given. Most flare kits will also supply a metal signaling “mirror” and a gun to shoot aerial flares. Add a strobe light, a foghorn and a powerful laser pointer, which can be better directed than flares at ships at night, have a long range and cost around $100. For offshore or long coastal voyages, carry a life raft. Many brands are available, but be sure to spec the size, based on the number of crew (bigger is not always better), and the type, either offshore or coastal (they’re different in construction and equipment). You can choose an automatically deployed system mounted on deck in a hard case and cradle, or a portable version in a soft-sided valise. It’s an item you pay handsomely for and hope to never use, but don’t skimp. A dinghy is not a substitute for a life raft, but it’s a way to stay dry and floating if the ship goes down. Make sure it’s inflated and has the plug in before each departure, because it may turn out to be much more than just a tender. In the event of a true emergency, calmer heads will prevail, and creating a course of action will make all the difference. Have a plan for various scenarios prior to departure and discuss them with all aboard. Once you’ve practiced, it will be easier to take the right steps if panic sets in. When panic sets in, people can forget to provide a good location or misread their GPS position, so teach everyone which numbers are key. If the situation is dire, call “mayday” three times, wait 10 seconds and repeat. Have instructions near the radio about how to call for help in case the one calling is not trained. A common mistake is waiting too long before contacting the Coast Guard, so if in doubt, make the call. A DSC-enabled (Digital Selective Calling) VHF radio is key. If you can’t make a call, push the DSC button on the VHF to start a relay from vessel to vessel to land unit until it reaches the Coast Guard. Get a nine-digit Maritime Mobile Service Identity (MMSI) number used to identify ships. This will tell the Coast Guard which boat is broadcasting and who to reach. The MMSI is free and easy to get by visiting NavCen.USCG.gov. Man overboard (MOB) is a frequently discussed emergency procedure, and the key is to make sure everyone knows the steps to recovering crew from the water, because it may be the captain who goes in the drink. First, shout “man overboard” to alert the crew. 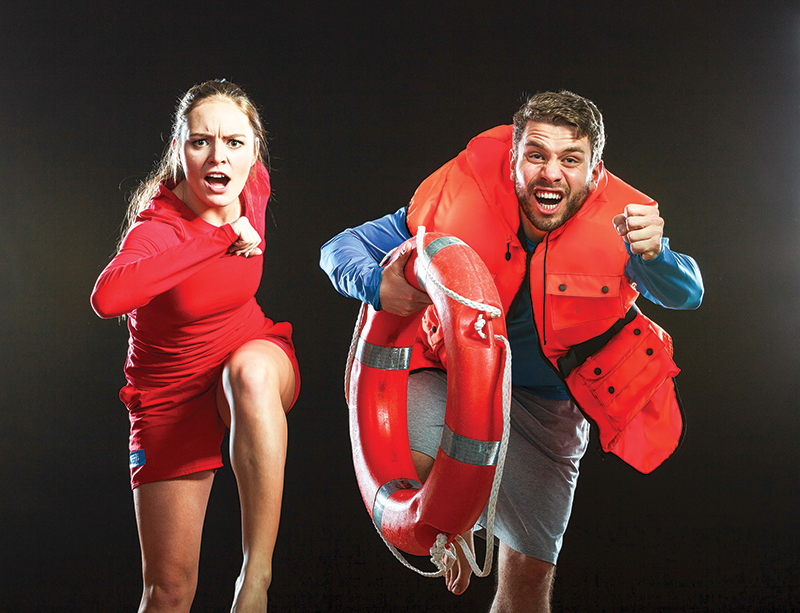 Stop the boat to prevent getting any farther from the victim and toss a life buoy or floatable PFDs in his direction. Press the MOB button on the GPS to mark the position and designate someone to point at the MOB and count, never taking her eyes off the victim. The counting helps keep track of roughly how much time has elapsed since the event and how far the boat may have gotten from the victim. If this happens at night or you lose sight of the person, send a DSC distress alert and a mayday. Use the track on the GPS to double back, or learn the Williamson turn, in case the track is not available. Recovery procedures depend on whether the victim is conscious and moving about or somehow incapacitated. Attitudes differ on whether you should approach the person in the water from windward or leeward. From windward, you can drift down on the victim and block the effect of wind and waves with the boat, creating a calmer environment. However, the boat could roll and hit the person, so the approach may be better from leeward. The procedure will be dictated by the conditions and the crew that is available to assist. Form a plan to hoist the victim onto the swim platform in case he can’t use the swim ladder. Fire aboard can spread quickly and be devastating within minutes. Per BoatUS statistics, roughly 40 percent of fires are related to AC and DC electrical systems, 12 percent can be tied to engine and fuel systems, and 20 percent are in the “other” category, which includes the galley. Starve the fire of fuel or oxygen: Know where the engine fuel shutoff and propane tanks are. Close access doors and hatches to cut off the air. Turn off batteries, unplug from shore power and turn off the main AC and DC panels. Throw burning cushions overboard before the fire spreads and watch for re-flash even after the fire seems to be managed. If you’re going the extra mile (both in distance traveled and effort expended) consider these five actions to enhance your safety and give you greater peace of mind. All crew should have basic medical training. You can opt for one-day classes in CPR and First Aid from the American Red Cross, the American Heart Association or a slew of independent providers. However, be mindful of the fact that such classes are geared toward urban environments where emergency medical services (EMS) are expected to arrive within 10 minutes, which is not the case on a vessel that is at sea. For long-distance voyages, all crew (usually both parties of a couple) should consider taking a wilderness survival course. This training is significantly more expensive and may require a week of time. Ask about classes that focus specifically on survival-at-sea tactics, because you may need to be your own paramedic. GPS-enabled tracking devices such as SPOT or Delorme’s inReach are affordable position locating and basic communication devices for casual check-ins or SOS messaging. You can send canned messages on SPOT and two-way texts on the inReach, but monthly charges apply for both. They are more affordable than satellite phones and EPIRBs, but they are not a substitute for either. File a float plan with a friend, relative or an on-water assistance service such as TowBoatUS. Include the name and type of vessel, point of departure and destination, time of departure and of expected arrival, and the number of people aboard and their names and ages. You can download a float plan form from USCGBoating.org, where you can also get an 86-page Federal Requirements Brochure, an accident reporting form and general survival tips. You can Google “abandon ship bag contents” to get started. However, restraint is key when packing a ditch bag, because you must consider where you will store it aboard, the room it will take up in a life raft, its weight and your crew’s ability to get it on deck, and how often you’ll take the time to keep its contents up to date. For short coastal voyages, if it’s time to abandon, plan to jump in the dinghy with at least the VHF and cellphone in a dry bag, PFDs, flares, a waterproof flashlight, and your personal and ship’s documents. Speaking of documents, having your paperwork in order and easily accessible is key to a quick or unplanned departure or being boarded by authorities. Keep the following at hand in one dry bag: vessel documentation, insurance, cruising and fishing permits, and any necessary entry documents for foreign countries. In the other dry bag, keep passports, credit cards and crew information, including medical needs.